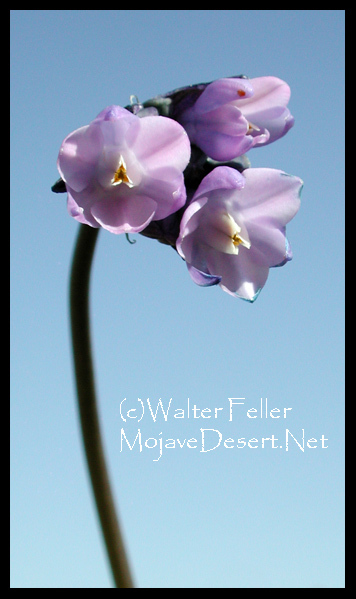 Brodiaea, wild hyacinth. There are two recognized subspecies: Dichelostemma capitatum ssp. capitatum and Dichelostemma capitatum ssp. pauciflorum (Torr.) G. Keator. Ethnobotanic: Large quantities of corms were gathered with digging sticks in over half of California, parts of the Great Basin and Southwest. These corms formed an important starch source in the diet of native people. California Indians dug and continue to dig the corms before flowering, during flowering, or after seeding depending upon the tribe and individual family. Traditional gathering sites were visited annually, over long periods of time and there are references to gathering tracts of different kinds of corms and bulbs specifically owned and maintained by particular families. Today different kinds of brodiaeas have gained popularity as cut-flower crops. Wildlife: Corms are eaten by both small and large mammals included black bears, mule deer, exotic wild pigs, and pocket gophers. The corms of blue dicks are highly desirable to vertebrates, and it appears that some corms are sacrificed to corm-eating animals as a price for the dispersal of others. The mammals detach the tiny corms as they go, aerating soil, preparing the seedbed, thinning the plant population, and leaving cormlets behind. Once dislodged, cormlets may take less time to reach flowering size. General: Lily Family (Liliaceae). Blue dicks is an herbaceous perennial. Major identifying features of blue dicks include a dense cluster of purple-blue or occasional white flowers with six fertile stamens, a twisted and fleshy stem, two basal leaves, a set of membranous, petal-like stamen appendages around the anthers, and angular black seeds. It reproduces from seed and vegetative means in the form of corms. The cormlets are attached to the parent corm by stolons or sessile, produced in the axils of the old leaf bases on the mature corm. It is found from Oregon, throughout most of California including the southern halfway of the Baja California peninsula, southeast into New Mexico, Arizona, and Sonora, Mexico. Adaptation: Blue dicks occurs from sea level up to 2,100 meters. It inhabits a wide variety of plant communities including vernal pools, coastal strand, mixed evergreen forest, chaparral, valley grassland, desert scrub, coniferous forests, oak woodlands, montane scree, and on the fringe of coastal salt marsh and redwood forest. It appears that it does not colonize after fire by seed, but rather is a permanent resident all along, occurring as inconspicuous corms in the soil throughout mature chaparral, often not flowering until an appropriate disturbance. With fire, plants are released from unfavorable shaded environments with brush competition, and vigorously flower in open environments with increased soil nutrients. If possible, obtain the seed and corms from local sources near where they will be planted, to maintain genetic diversity of blue dicks and for the best adaptation to local conditions. Some plant nurseries may label their corms and seeds according to geographic source. Propagation by seed: Seeds sown in the fall usually readily germinate and do not need special treatment. If sown at other times of the year the seeds may need one month's stratification. If planting seeds, they will take several years to reach flowering size. Scatter seeds and rake them lightly into the soil in full or partial sunlight. If planting seeds in pots--then place them in reduced sunlight on the east or north side of a building or under a deciduous tree. Plant the seeds at a depth, which equals the width of the seeds. They should be planted in a well-drained soil. Water the seeds after planting and don't let the soil dry out completely. Water them again when the surface is dry to the touch. Water the seeds gently so as not to exhume the seed. If using a watering can, diffuse the water flow with a sprinkler fan or head. Protect the seeds from animals and cold, dry winds, and from weed competition. The seedlings should be watered through the spring. At the beginning of hot weather, the leaves will start to yellow. At this time, cease watering. If the seeds are in pots, then move them in summer to a darker area, such as a carport or garage and keep a screen on them to keep out foraging animals. When the weather cools down once again, move the pots back outside and go through a full rain or watering cycle once again. After 24 months, the corms can be planted in full sun or filtered shade in October or November. Plant them about six inches apart or scatter the corms and plant them where they fall to give them a look of a "natural" distribution. After one bloom, the plants should be well established so that they don't need to be weeded or watered unless it is a dry winter. If it is a dry winter, then water every three weeks. Corms are the easiest to start. Plant bigger corms 3-4 inches deep and smaller corms 1-2 inches deep in well-drained soil in full sun in the autumn, and the plants can tolerate afternoon sun. Space the corms one-inch apart. If pocket gophers are a problem, you may want to dig a hole and line it with chicken wire mesh, before planting corms. (Plastic mesh won't stop gophers.) Water the plants (wet, but not soggy) and then wait for the winter rains. The plant is common in climates that have rain in winter and spring, and a summer dry season. Therefore, simulate these conditions in the garden. The plant is intolerant of frequent summer water and should not be planted near lawns or plants that require a lot of moisture during the summer. Weed around the plants regularly. There are five major types of indigenous management activities conducted in California that were designed to ensure future corm production at traditional gathering sites: 1) conscious breaking off cormlets from the harvested parent corms and replanting them; 2) sparing whole plants; 3) harvesting the corms after plants have gone to seed and dumping the seeds in the hole; 4) burning areas; and 5) irrigation. Periodic digging and thinning of the corms, and popping off the cormlets, and replanting them may enhance blue dicks numbers and densities. Digging corms may in fact be a form of tillage, which will increase the size of the gathering tract, aerate the soil, lower weed competition, and prepare the seedbed to increase seed germination rates. If blue dicks populations require periodic disturbance to maintain and increase their populations, then indigenous harvesting regimes, if reenacted, may help maintain populations. At the very least, populations that become overcrowded and show reduced vigor should be divided and separated. Traditionally, various tribes in California have burned areas of blue dicks to reduce plant competition, facilitate gathering, recycle nutrients, and increase the size and number of corms. Today grasslands that have been burned may exhibit thousands of blue dicks plants where none appeared to occur before. Corms and bulbs may sit for a decade or more and wait for fire or other favorable environmental conditions before breaking ground. Suppression of fire may cause increased shade and plant competition and decrease population numbers of blue dicks. Anderson, M.K. 1997. From tillage to table: the indigenous cultivation of geophytes for food in California. Journal of Ethnobiology 17(2):149-169. Anderson, M.K. & D.L. Rowney 1998. California geophytes: their ecology, ethnobotany, and conservation. Fremontia 26(1):12-18. Bean L.J. & K.S. Saubel 1972. Temalpakh: Cahuilla Indian knowledge and usage of plants. Malki Museum Press, Morongo Indian Reservation, Banning, California. Chestnut, V.K. 1902. Plants used by the Indians of Mendocino County, California. Contributions from the United States National Herbarium, Government Printing Office 1900-1902. Vol. 7:295-422. Reprinted in 1974 by the Mendocino County Historical Society Inc., Fort Bragg, California. Fowler, C.S. 1986. Subsistence. Pages 64-97, IN W.L. D'Azevedo, editor. Handbook of North American Indians. Vol. 11: Great Basin. Smithsonian Institution, Washington, D.C.
Heffner, K. 1984. Following the smoke: contemporary plant procurement by the Indians of Northwest California. Unpublished report, USDA, Six Rivers National Forest, Eureka, California. Keator, G. 1989. The brodiaeas. The Four Seasons 8(3):4-11. Keator, G. 1992. Blue dicks brodiaea (Dichelostemma capitatum): A common but problematical species. The Four Seasons 9(2):31-42. Keator, G. 1993. Dichelostemma. Pages 1190-1192, IN J.C. Hickman, editor. The Jepson Manual: Higher Plants of California. University of California Press, Berkeley, California. Lawton, H.W., P.J. Wilke, M. DeDecker, & W.M. Mason 1993. Agriculture among the Paiute of Owens Valley. Pages 329-378, IN T.C. Blackburn and K. Anderson, editors. Before the wilderness: Environmental management by Native Californians. Ballena Press, Menlo Park, California. Mayes, V.O. & B.B. Lacy 1989. Nanis�: A Navajo herbal. Navajo Community College Press, Tsaile, Arizona. Niehaus, T. 1971. A biosystematic study of the genus Brodiaea (Amaryllidaceae). University of California Publications in Botany 60, Berkeley, California. Peri, D.W. 1985. Pomoan plant resource management. Ridge Review 4(4). Mendocino, California. Grows from a bulb. Several tiny 6 petaled flowers grow on top of a reedy stem. May may reach two feet in height.